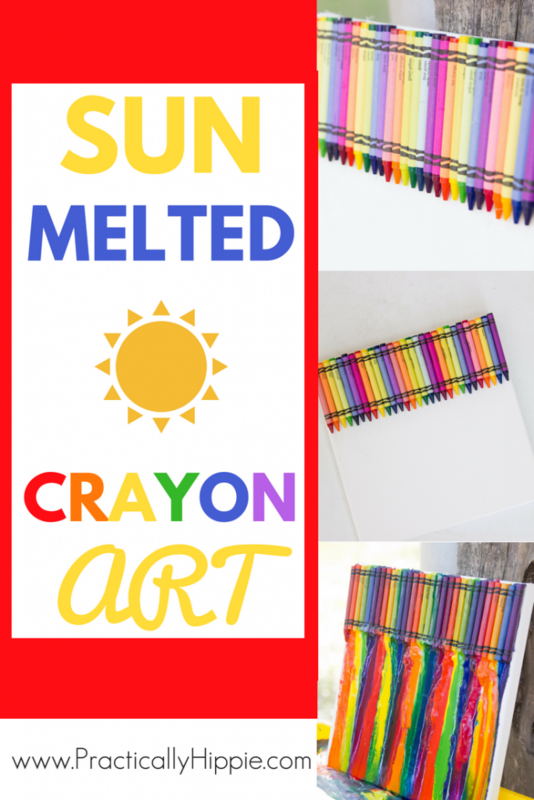 Take advantage of the summer sun to create this fun sun melted crayon art project. We’re in the midst of a summer heat wave, and it’s just brutal. No matter how long I live in South Texas, the summer heat always comes as a shock! Just how hot is it outside? 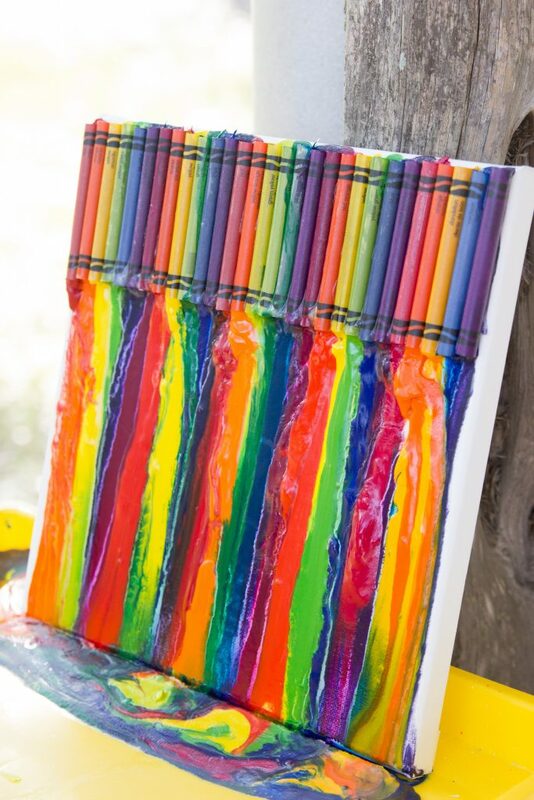 Hot enough to melt crayons! I saw a friend post this idea on Instagram, and I knew my kids would love it too. We had all of the supplies on hand and got to work putting it together. 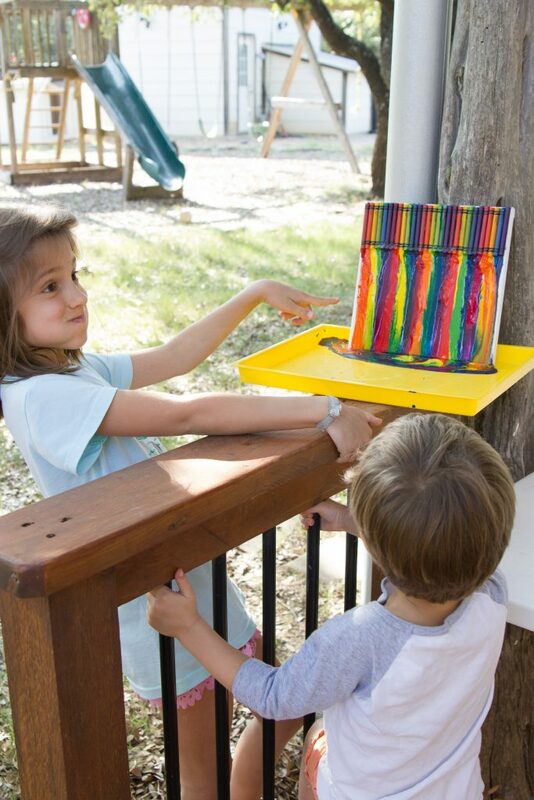 One part science and one part art, this sun melted crayon art project was simple to set up, fun to watch, and now we have a sweet piece of art to display in one of the kids rooms. Use Crayola brand crayons for best results. Read why down below! 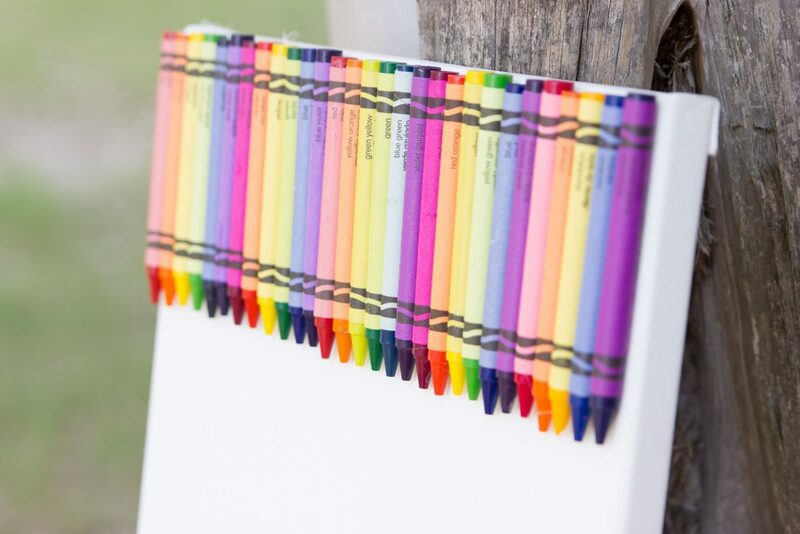 Find packs of canvas on clearance at your favorite craft store for a fraction of the cost. I find these all the time usually because one canvas is damaged, but the rest of the pack is fine! We used one of our favorite learning trays to catch the excess wax, but i would definitely suggest using a scrap piece of cardboard for easier cleanup. 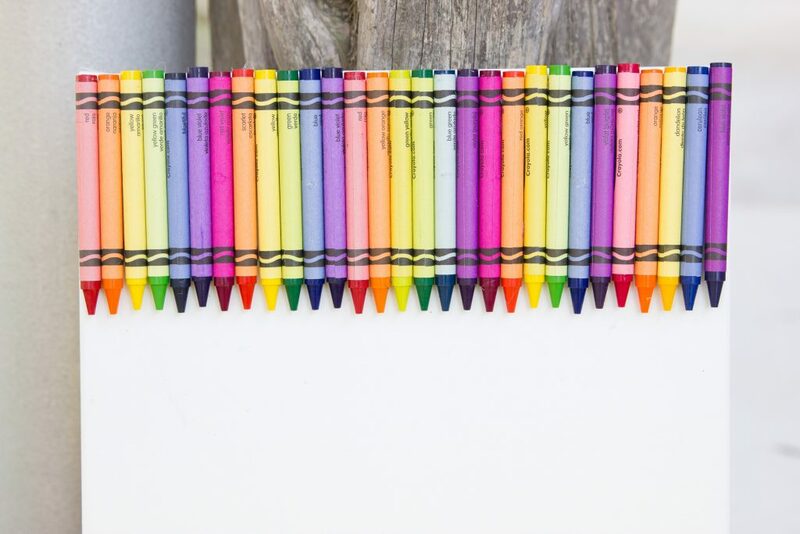 Hot glue crayons along one edge of the canvas. Place glue on the paper only and make sure to use a good amount to ensure the crayons stay in place. It does not matter which end of the crayon is pointed downward. Find a spot that gets full sun for most of the day where your canvas can sit undisturbed. Set your canvas in full sun with a large scrap piece of cardboard underneath to catch the excess wax. Wait 4-8 hours for the wax to melt and drip out of the wrapper and onto the canvas. Unfortunately, our first attempt was an epic fail! I’d actually say it was a true science though because sometimes a hypothesis doesn’t work out like you predicted. We made some changes to rework the experiment and our second attempt was a success. The key to success with this project is the type of crayon. 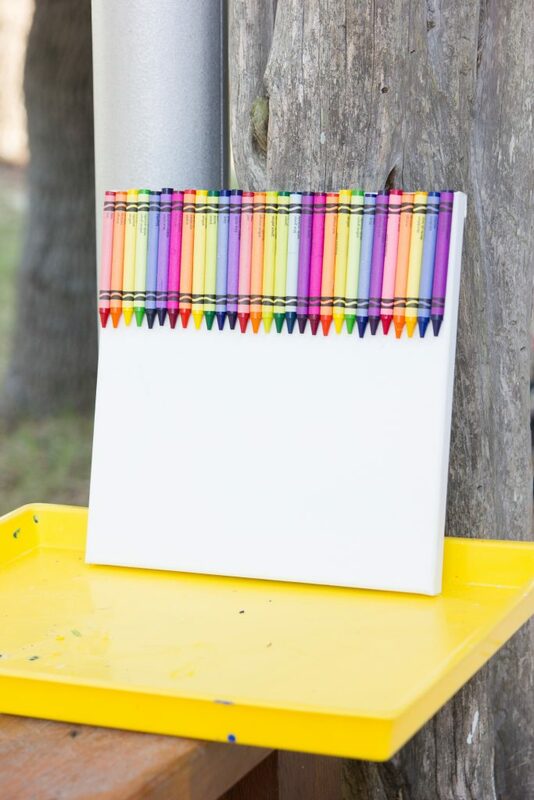 We’ve had several boxes of Cra-Z-Art crayons leftover from a school supply clearance sale a few years ago so we grabbed those and set to work hot gluing them to a canvas. We set the canvas outside on a day where the temperature reached 102 degrees with a heat index of 110 degrees. After 8 hours, our crayons were still intact and the only change was a clear waxy, oily substance had dripped down the canvas under each crayon. Most of the crayons had fallen off the canvas too. We were so bummed that it didn’t work! I did some Googling and found others having issues with melted crayon crafts when using generic crayons. So we tried it again to see if name brand Crayola crayons would make a difference. Crayola crayons were the secret to success! 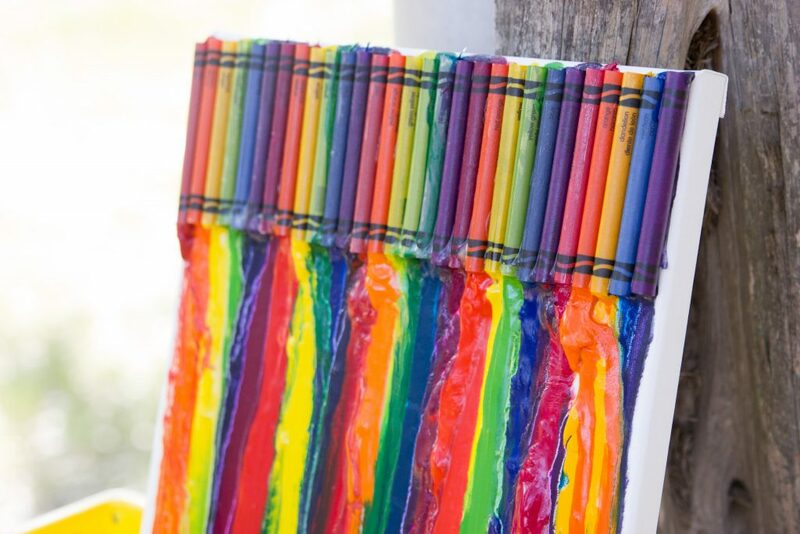 After about six hours on a 99 degree day, the wax melted completely out of each crayon wrapper and onto the canvas. We only had one crayon on the very end that fell off, probably because it was on the edge and didn’t have enough contact with the glue on the canvas. 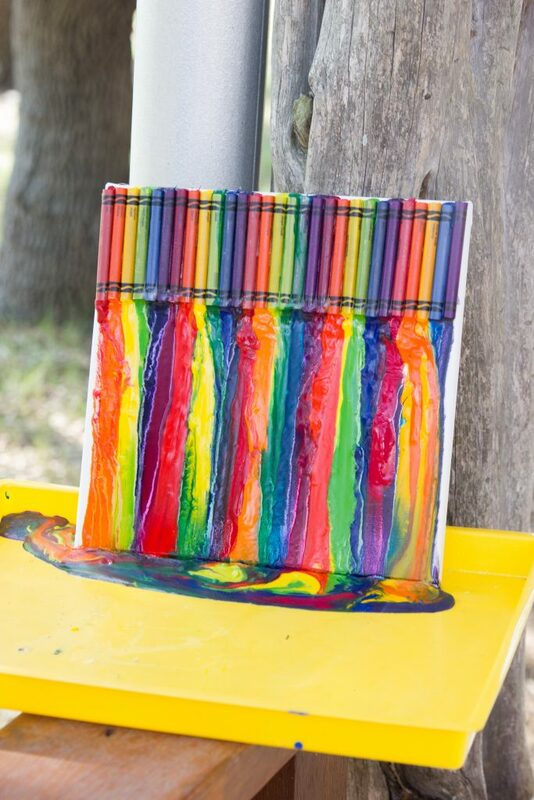 The result of this sun melted crayon art was so neat and surprised us all after the big fail! I pulled the canvas off of the tray and moved our masterpiece inside to cool off. Save the pool of melted wax on your tray/cardboard in a zip top bag for another project another day. Hang your custom artwork as a memento of the summer sun you can remember all year long! Find more fun handicrafts on the blog here. Wow! This turned out just beautiful and I cant wait to try it because it sure is a hot summer this year. Thanks for this fun post. So hot! but this was so fun! This is stunning! It’ll be a great way to incorporate science and art. Thanks, it sure was fun to do!